Blue Rider Press, 9780451472519, 464pp. Bold, brash, and beautiful, DEA agent Kay Hamilton doesn’t always like to play by the rules, even though she’s charged with upholding them. 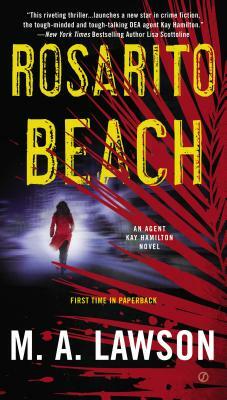 Having recently been transferred to San Diego after a case in Miami brought her more notoriety than medals, Kay once again finds herself embroiled in an international bust. Tito Olivera, younger brother of drug czar Caesar Olivera, is within her grasp. If she takes down Tito, Kay is positive that Caesar will follow—and when Caesar falls, so does the largest and most vicious cartel in Mexico. But when a mysterious stranger shows up on her doorstep, the Olivera case suddenly becomes far more personal—and far more dangerous. Now, Kay must decide how much she’s willing to sacrifice to get her man. M.A. Lawson is the pen name for award-winning novelist Mike Lawson, a former senior civilian executive for the U.S. Navy, and creator of the nine novels in the Joe DeMarco series, including House Odds, House Divided, and The Second Perimeter, as well as the Kay Hamilton novels Rosarito Beach, Viking Bay, and K Street.